Since I just finished my Chaco Canyon trip report over on myXJ.net I thought I would post up one of my favorite rock art photos from the trip. 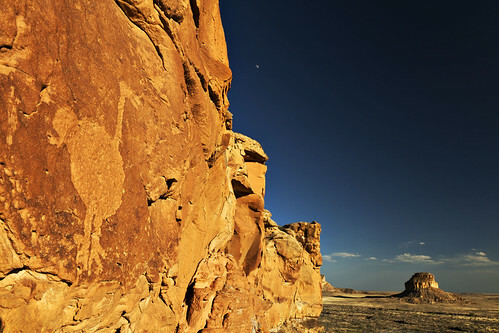 This bird-like petroglyph that looks like a turkey watches over Chaco Canyon and Fajada Butte as the sun gets ready to drop below the horizon near Una Vida. I had visited this petroglyph earlier in the day and knew that I would have to return at sunset for this shot.